Even before the first practice in the wilting heat of late August, anticipation was building for the boys' soccer 2016 season. In pre-season coverage, the Star Ledger predicted Gill would be "one of the best teams in the state" this year. 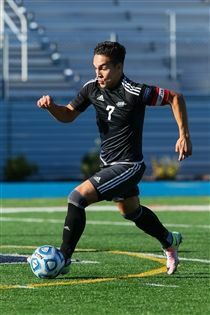 In mid-August, the team's stellar midfielder Steven Bednarsky '17 was named to the USA Today All America watch list. In addition, the season promised a major career milestone for head coach Tony Bednarsky, who had finished out 2015 with 398 GSB wins. Finally, 2016 represented the last chance for the team's seniors to earn a state title. Each of those seniors had been a starter on the 2013 state championship squad, but the title had proved elusive since then. 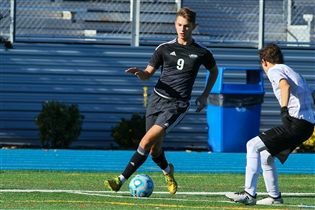 Fans may have felt a flutter of anxiety when the team lost its season opener 2-0 against Rancocas Valley High School, despite 13 saves from keeper Alex Roch '17. It would turn out to be the only loss in September, however, with the Knights mounting a seven-game winning streak. Among those games, a 1-0 win over Somerville High on September 15 marked 400 career wins with Gill St. Bernard’s for coach Bednarsky. After a triumphant September, October brought tough competition, illness and injury—all against the backdrop of regional tournament play. The Knights continued to post wins, but the Somerset County title and the Prep B title were not in the cards. In November, coach Bednarsky looked optimistically toward the state tournament, noting that the team was healthy again and, win or lose, the Knights would put their best squad into the mix. 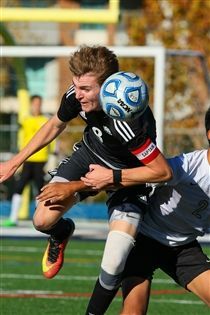 On November 4, the boys made a decisive statement in the quarterfinal round, defeating the Ranney School 7-0. In a true team win, four players recorded goals (seniors Steven Bednarsky, Kevin Brito, and Anes Mrkulic '17 and junior Bailey Gano), two freshmen (Tyler Merna and Dan Shen) contributed assists, and on goal, Roch held the opponent scoreless. 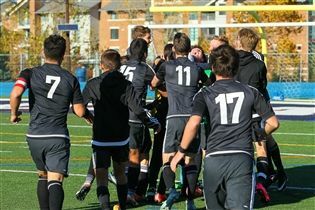 On November 7, the Knights defeated Gloucester Catholic 3-0 in the semifinal matchup. It would be the last game of the season that the Knights would play on home turf, and the fans turned out to show their support. The team's seniors led the charge, with goals and assists from Brito, Cam Miller and Mrkulic and another shutout for Roch on goal. On November 10, under the lights in Holmdel, New Jersey, the Knights defeated Wildwood Catholic 4-0 to earn the South Jersey, Non-Public B title—the team’s second title in four years. The Knights controlled the game throughout, with Mrkulic scoring within the first minute and Brito adding another goal before the half. Steven Bednarsky and Mrkulic each contributed a goal in the second half. 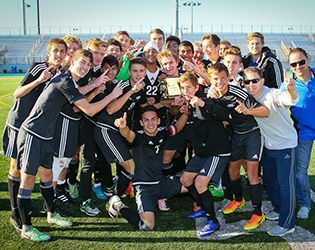 On November 13, the team defeated Hudson Catholic 2-0 at Kean University to win the NJSIAA Non Public B state championship. Goals came from offense leaders Brito and Mrkulic, while strong defensive play, combined with six saves from Roch, gave the Knights their fourth straight shutout win. After the win, the team’s seniors breathed a collective sigh of relief and reflected on the season. 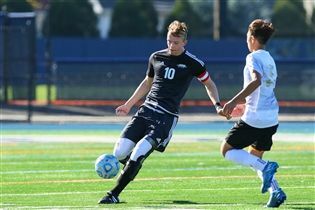 "It feels great to end my Gill soccer career surrounded by my senior teammates and as state champs," said Steven Bednarsky. "It was a special win for the team and for my dad." Miller offered, "We came into the year with a lot of goals. We missed some of those smaller goals, but in the state championship, we were all business. We knew it was the last time we would be playing for the school and alongside one another. It was a really special win." 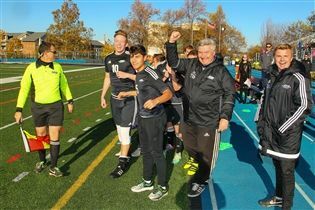 Mrkulic echoed those sentiments, saying "It was a little disappointing not to get the county championship, but ending the season with a win and a state championship is definitely one of the most memorable moments I've had as a soccer player." Crediting the players and their ongoing commitment for the win, coach Bednarsky said, "In many ways, the state championship game was a reflection of our season. The boys overcame much adversity and worked tirelessly. Their efforts culminated with a well-earned and deserved state title. They represented the school, our team and themselves very well."